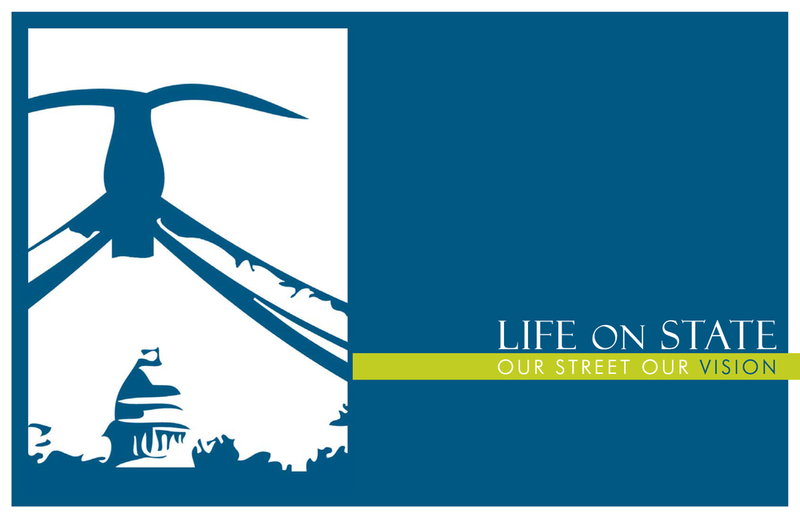 The Life on State project establishes a shared vision for the future of our valley's central, historic corridor. The vision was built on broad involvement from residents and stakeholders along State Street. The partnership believes that its coordinated efforts can create a safe environment for private investment consistent with the Vision, a move in a new direction is not a risky proposition if it is backed by a strong, enduring commitment from the Life on State partnership. Developed in cooperation with the Utah Department of Transportation (UDOT), the Utah Transit Authority (UTA), and the Utah Division of Air Quality (DAQ), the Wasatch Front Regional Transportation Plan: 2015 – 2040 (RTP) provides a 25-year list of recommendations and improvements for highway and transit facilities, pedestrian and bicycle paths, park-and ride lots, and airport and freight services throughout the region. In the State Street Corridor, the RTP calls for operational enhancements and Bus Rapid Transit or enhanced bus along State Street, and bike/pedestrian improvements on multiple north-south roads. Plan Salt Lake sets a citywide Vision for Salt Lake City for the next 25 years. It considers where we are as a city, where we want to be, and establishes the framework for decision making that will get us there. The Plan intends to set the state for future neighborhood, community, and City element plans to address how they will each contribute to the 2040 Vision for Salt Lake City. 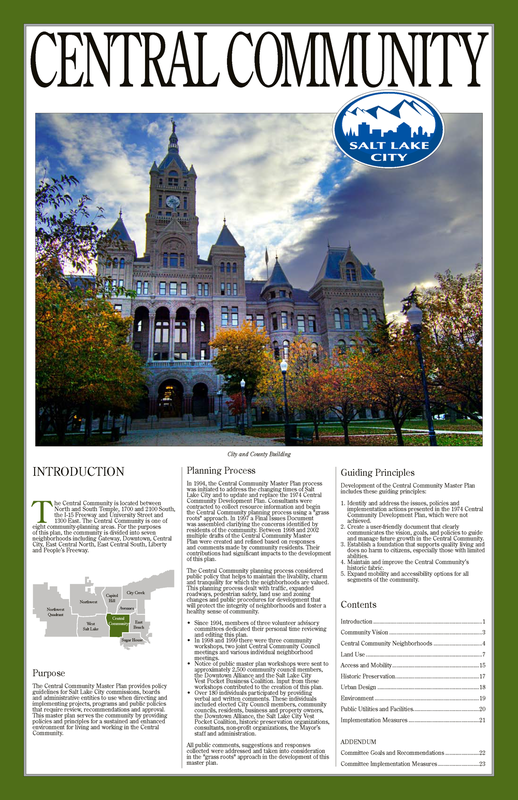 The Downtown Plan coordinates with other plans and City Hall policies, primarily Plan Salt Lake, to help implement citywide goals. It is the companion plan to Downtown in Motion (2008), the transportation plan for downtown that aims at balancing all means of travel, whether by foot, bicycle, transit or car. It identifies key opportunities and challenges in responding to the growth needs of the region, and provides direction to decision makers and the private sector on how to implement a livable, sustainable and economically robust downtown Salt Lake City. Downtown In Motion is a balanced plan. It provides for more TRAX lines in Downtown without the loss of a single automobile lane. It helps make Downtown competitive with the suburbs for those who visit by automobile and need to park. The plan allows you to get around easily with well-thought-out transit service and bike and pedestrian walkways. Downtown In Motion will make walking and bicycling interesting, fun, and safe. The Salt Lake City Pedestrian & Bicycle Master Plan works to make walking and bicycling safe, convenient, comfortable, and viable transportation options throughout the city. It devises strategies and recommendations to connect people to places, foster recreational and economic development opportunities, improve personal health and the environment, and elevate quality of life for all people in Salt Lake City. The Salt Lake City Transit Master Plan is a blueprint for the future of transit in Salt Lake City. The Transit Master Plan emphasizes providing choices in travel and reducing dependence on the single occupant automobile. The plan builds on numerous plans from the past decade that have identified the availability of safe, high-quality, convenient transportation choices as a critical tool to support health, economic competitiveness, and quality of life in the region. environment for living and working in the Central Community. The South Salt Lake General Plan aims to provide a sustainable and enduring community, safe neighborhoods, attractive and thriving business areas, employment opportunities as well as parks and open spaces. It guides the development of a multi-modal transportation network, and makes a commitment to preserving and caring for the natural resources of the area, to beautifying public areas and streets, to creating a safe and secure community and a commitment to develop human resources. The Downtown Master Plan is an outline of the foundations, aspirations and building blocks of a new city center. This is a vision with a 25-year horizon for growth and change in this unique neighborhood, and transformation to a walkable, urban place to serve as a city center. This plan reflects input of hundreds of residents, businesses and community partners over the past decade as they have called for city leaders to facilitate building a “heart of the community” that they could call their own. The intent of the South Salt Lake City Moderate Income Housing Plan is to ensure that the City provides ample opportunities for quality housing for all residents, especially those who live in cost-burdened households or who experience critical needs. While South Salt Lake provides a considerable amount of housing to the region’s low- to moderate-income households, the need for additional housing opportunity is still acute. This plan advocates for additional affordable housing such that any resident can fully participate in and benefit from all aspects of neighborhood and community life. South Salt Lake City is a diverse, centrally located City in the heart of the Salt Lake Valley. Strategically located at the interchange of I-15, I-80 and SR-201 and being a major mass transit corridor, with all three TRAX lines and the S Line running through the Central Point Station, the City is well-situated to attract shoppers and commuters who travel along the major transportation corridors in the area. This report identifies and organizes the City into six key economic development districts. The State Street District allows the City the opportunity to participate in bringing grandeur back to this important and iconic corridor.